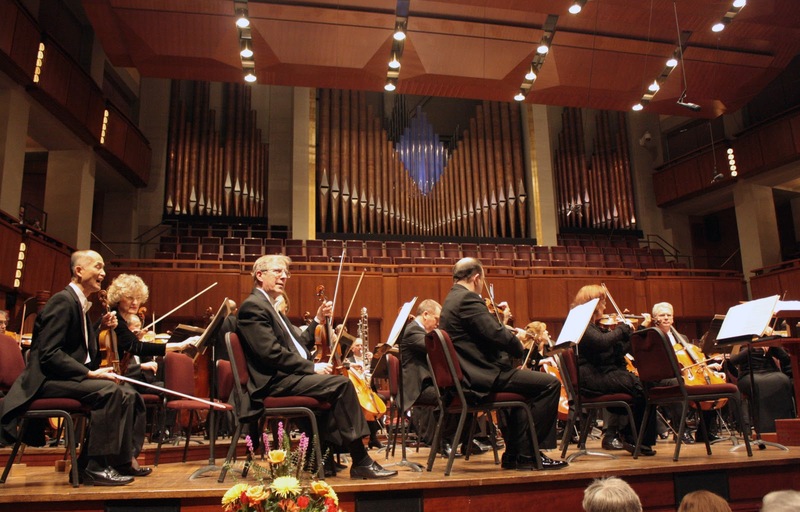 Last week my mom gave me a call on Thursday night, asking if I wanted to go with her to see the National Symphony Orchestra at the Kennedy Center the next day. I was like, "Huzzah, a mother daughter date, of course!" the immediately began to wonder what I could wear! I would have to go straight from the office and it was Casual Friday, hmmm. Now I know I could have worn something nicer - it's not like there's Casual Friday police (though sometimes I think there should be...) but I thought it could be a fun challenge to pull together a look that worked for both situations! Here I am in an outfit that I think pulls off a lot of different things! I have a nice denim dress as an homage to Casual Friday (I have to mock myself for saying that but I can't think of a better way to explain it! 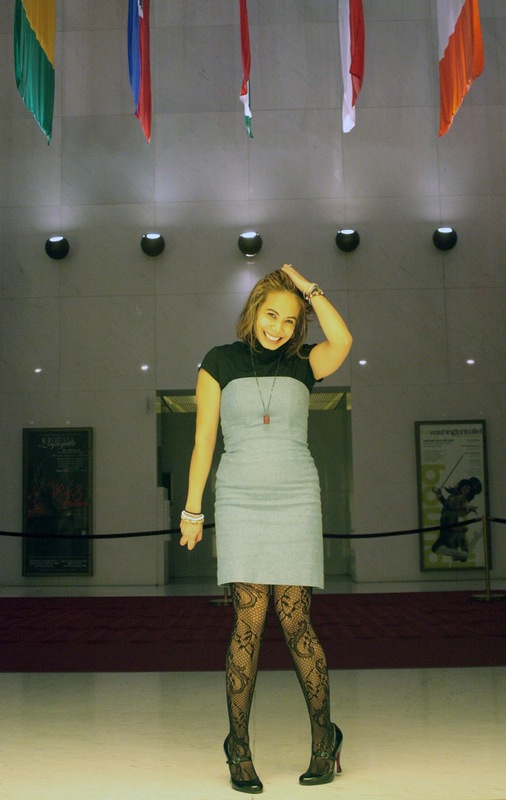 ), paired with a black short sleeved turtleneck to make it both work and winter appropriate! 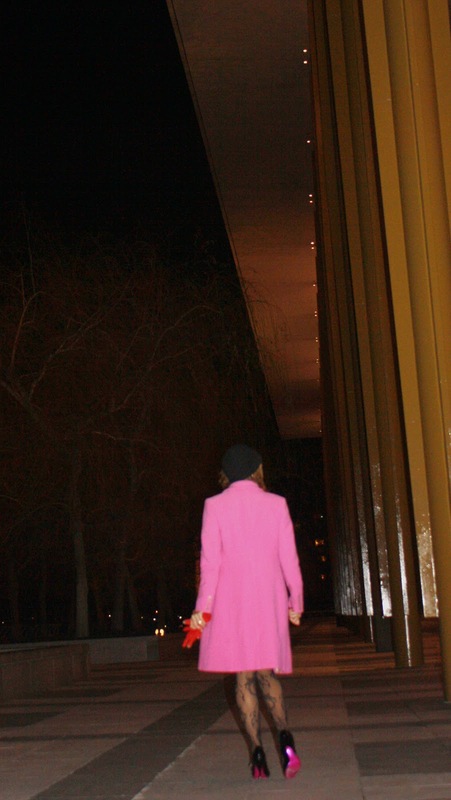 Don't you just die over the majesty of the Kennedy Center? It occurs to me that it's been years since I've seen a show here - totally unacceptable! Luckily for me, I'm also seeing La Cage aux Folles in a few weeks starring George Hamilton! It's the musical The Birdcage was based on - SQUEE! Even though it was freezing outside, I had to check out the view! Check out the pink soles on heels! 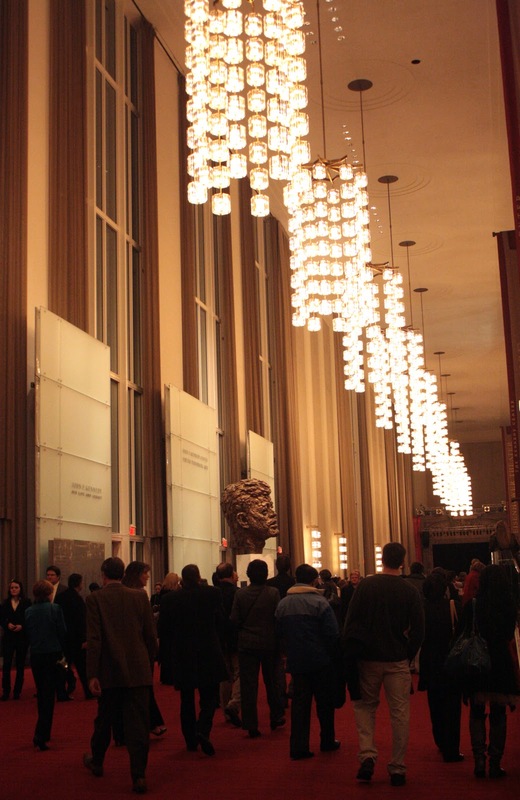 The Kennedy Center overlooks the Potomac river. 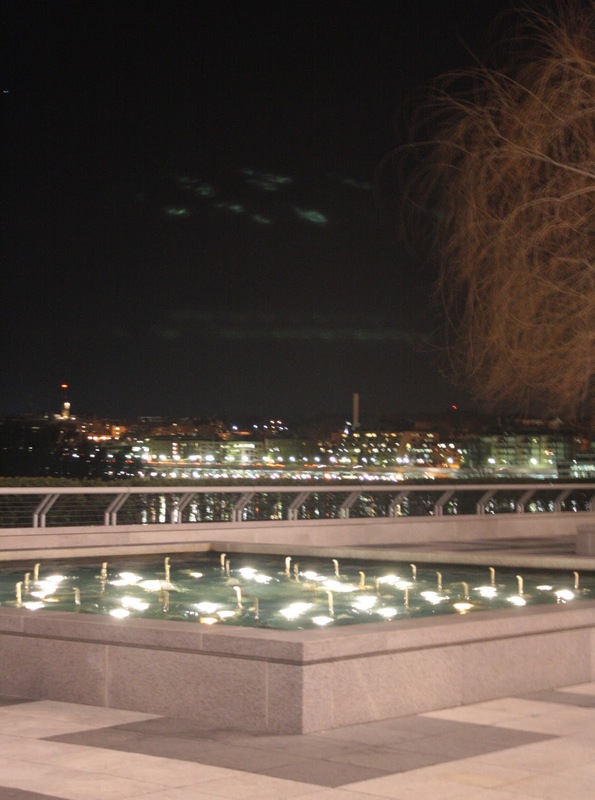 On a summer night this is probably one of the most romantic places to be in DC! I'm wearing: Shosanna denim dress from Bluefly, pink J. Crew lady day coat, Rodarte for Target lace tights, red gloves given to me by my sister from ModCloth, heels by Christian Lacroix, cloche from DC's Proper Topper. Jewelry includes Marc by Marc Jacobs pendant from ShopBop, bracelets from Juicy Couture and CUSP, and a vintage Gucci watch. OMG, isn't this just the cutest ever? 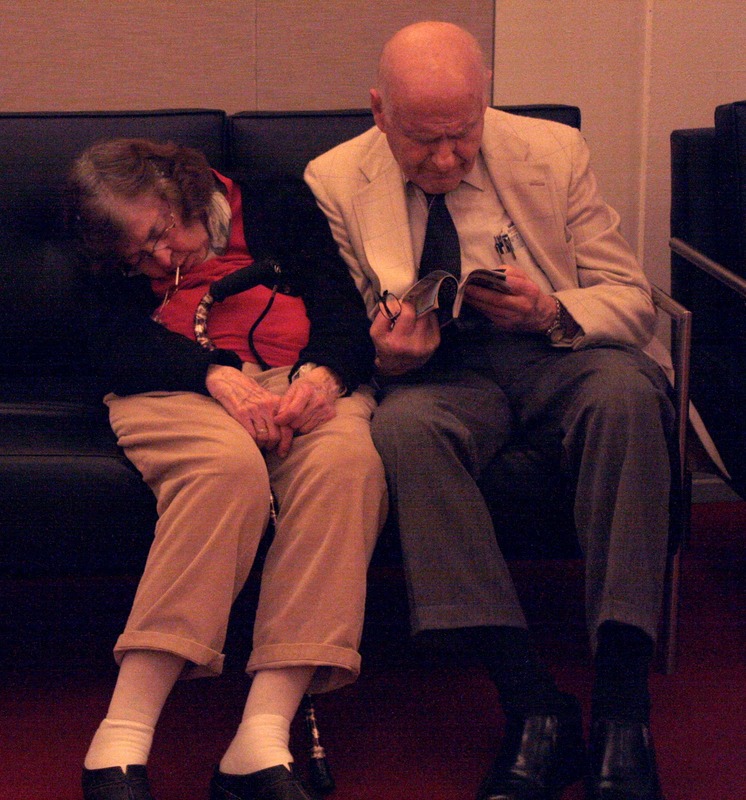 Aww, little old couples are my favorite - add in sleeping with a lollipop in your mouth and you get uber adorable! The symphony itself was amazing - I've seen the NSO countless times and they never fail to impress! We heard Preludes by Debussy, Symphony No. 5 by Sibelius and Beautiful Passing by Steven Mackey, which was definitely the standout of the night! Just downloaded Beautiful Passing - so dynamic!